Innovation is the key driver of competitive advantage, growth, and profitability. 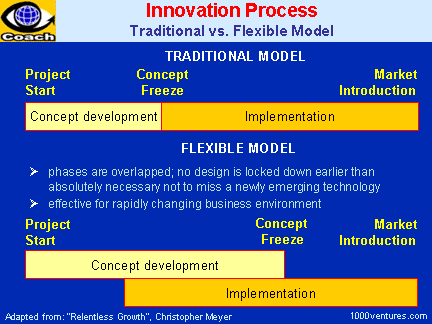 There are many parts of the whole field of innovation: strategy innovation, new product development, creative approaches to problem solving, idea management, suggestion systems, etc. All of these components are important. “Yet approaching them piecemeal will bring piecemeal results… These seemingly disparate issues must be integrated into a single overarching strategy if they are to be mobilized in the quest for growth.”6 In this new era of systemic innovation, you must design your firm’s innovation process holistically. a company has never had a defined innovation process and can use the phase-gate paradigm as a good first step to stabilize innovation before trying to speed it up.